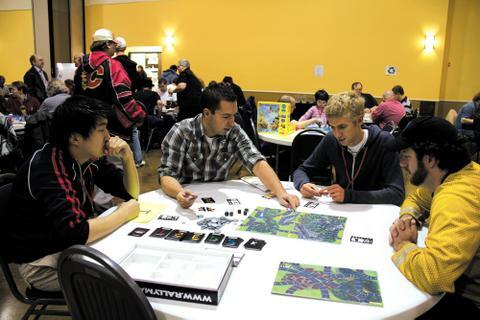 Near the end of December, I got an email from one of the organizers of Fallcon, Calgary’s largest board game convention (yes, there are multiple board game conventions in Calgary), inviting me to a “board game invitational weekend” in Canmore. It’s an annual tradition, he said, to invite “ambassadors to the hobby,” and because I’ve written a few of these columns now, I apparently qualify. My first reaction was that this is obviously something I need to do. One of the more difficult aspects of writing about board games is that they aren’t always easy to try. Not only do you need a copy of the game — and they are, for the uninitiated, often surprisingly expensive — you also need a group of people who are interested in playing, and willing to learn a new game. If it’s a game that needs more than two or three people to play, it’s easy for months to go by without cracking the plastic on a new purchase. And if, for the sake of thoroughness, you’d rather try a couple of play-throughs before passing judgement, you can see how a weekend devoted to nothing but new games, with people at least as nerdy as you are, would have its appeal. On top of that, though: “ambassadors of the hobby.” I’ve known for a while that Calgary has an extensive board game community. We may not have a gaming café like Toronto’s Snakes & Lattes or Vancouver’s Stormcrow, but between Dickens Pub’s Gamer Sundays, the longstanding Magic: The Gathering nights at Broken City, and open gaming at local shops like Sentry Box and Myth Games, it’s obvious a lot of Calgarians have a passion for tabletop gaming. Still, the notion of a hierarchy, an elite cadre of gamers who set the tenor of the next year’s dice-rolling adventures, was something that never occurred to me. And it’s also not really the case. The thing about games is that they’re so inherently social that it’d entirely defeat the purpose to be elitist about them. Everyone at the invitational was there because they wanted a chance to try a game they’d never played, whether it was a German-import party game, a strategic epic based on a Neil Gaiman story, or a kids’ game that takes the giant monster genre so far past King of Tokyo that you’ll never look back. The fact you could share those games with folks who aren’t intimidated by the thought of learning something where the condensed rules are still 16 pages of solid text is just icing on the cake. I’ll be writing about most of the games I tried in the coming months, along with plenty more, but it seemed just as important to point out that things like this exist locally. Like so many other aspects of the city’s culture, it’s hidden away, and taking the plunge can be intimidating. But it’s worth it to find yourself with some like-minded geeks, indulging in a new obsession.